Revolving Chairs, Rotating Chair online with Price, Manufacturers, Suppliers, Traders and Companies in India. We offer different varieties of Stools & Chairs- Revolving Top & Standarda nd custom made designs to catch up with the emerging trends of the industry. We are manufacture SS Revolving Chairs and SS Fix Chairs in SS 304 quality material in standard size. 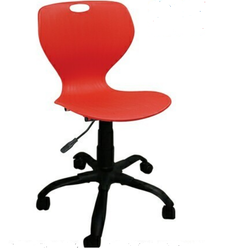 To meet the variegated requirements of our customers, we are involved in providing Steel Revolving Chair. Furthermore, we offer this product at nominal costs. Backed by huge industry experience and market understanding, we are involved in offering a wide array of SS Revolving Chair to our valued patrons. Owing to the expertise of our professionals, we have emerged as the foremost organization of an excellent quality array of SS Revolving Chair. Checked against variegated quality parameters, the offered chair is made available different sizes and designs to furnish specific choice of our clients. Description: : Available in different designs. We offer our clients extensive range of staff chairs that are widely used in MNC’s, banks and corporate sectors. These chairs are designed in such a manner that ensures the correct posture, while sitting for a long hours. We are looking for Delhi/NCR query's.